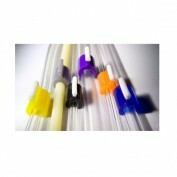 Elkay introduct a new product to their peristaltic pump tubing range - Accu-rated™ PVC tubing with flared ends.! Attaching small bore peristaltic pump tubing has never been easier. 'Flared ends' provide an easy option for attaching tubing particularly if the I.D. is close to or smaller than the connector to which it is being attached. Available as part of our Accu-rated tubing range which is ideal for general laboratory use, is non-toxic, non-aging and has good resistance to most routine chemicals. All PVC Accu-rated 2 bridge or '0549 -series' tubing can be ordered with flared ends, Click here to see our flared end tubing range in detail or use or online Enquiry Form for more information.